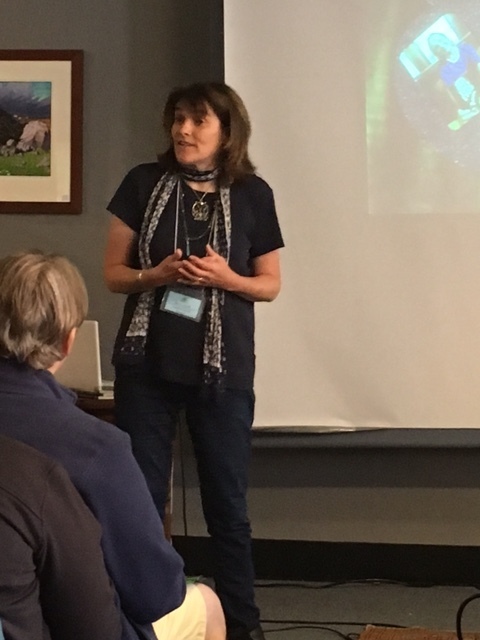 Organized by Tiffany Jimenez at Book Passage, this conference was packed full of amazing presentations from the Keynote with Newbery Honor author Gennifer Choldenko, to Ying Compostine's no-holds-barred presentation on writing award-winning novels. I had a fantastic time presenting on Bravery in Middle Grade Fiction, (character and authorial) and sharing some of my experiences promoting a book published by a small press on an author panel with Esther Erhlich, Nest, Jennifer Lynn Alvarez, Guardian Herd series, and Ying Compostine, Revolution is not a Dinner Party. Thank you Tiffany for a fabulous conference! A. E. Conran Featured on YAReads Website! Very excited to have been interviewed by Nicole as part of the YA Reads 2016 Debut Author Bash. YAReads is a tremendous resource if you are looking for information and reviews. Click here to read my interview. Honored to be featured on El Space, L. Marie's award winning blog this Memorial Day. To read more about the inspiration for The Lost Celt, and to which time I'd like to travel back, click here. On pages 131-133 of The Lost Celt Mikey's teacher discusses the difference between Veterans Day and Memorial Day, BTW. Author Reception at Northern California Independent Booksellers' Association Spring Gathering, April 10. Photo taken by my first visitor, Carolyn, from A Great Good Place for Books, Montclair. For the first time, and hopefully not the last, I was on the other side of the table signing books as part of the author reception at the NCIBA Spring Gathering on Sunday. So much fun to share my love of story and history with fellow booksellers. Only in a group of booksellers (and historians) would you get two people walk up consecutively, point to my necklace and say, "Oh isn't that Cernunnos from the Gundestrup Cauldron?" Could there have been a better first school to visit, post-launch, with The Lost Celt than the Urban Promise Academy, Fruitvale, Oakland? Their school motto is "Developing Scholars, Warriors and Artists," so my character felt completely at home. I had a wonderful evening talking, and then whispering, about The Lost Celt. Yes, I'd lost my voice by the end of the evening, thanks to a cold at the weekend, but the UPA Jaguars just listened extra hard. Thank you! Thank you to L. M. Quraishi for featuring The Lost Celt on her blog with this thoughtful review. Michelle is a fellow writer and member of the Society of Children's Book Writers and Illustrators. Read the review here. Check out the blog of fellow debut author Patrick Samphire, Secrets of the Dragon Tomb, a fabulous middle grade sci-fi novel set on Mars in 1816. (What's not to like about that?) Patrick kindly featured The Lost Celt and several other debut novels on his blog. Click here to read more. On December 23rd I was featured on the Sweet Sixteens YA and MG debut authors' site. Click here to read the interview.